About an hour from where I live lies the town of Peshtigo, Wisconsin. For years, I drove right past the main highway leading to this town, never even realizing its importance in history–and yes, some critical history happened there. But unfortunately, few then and even today know much about it, due to the disaster being overshadowed by a more important event, the Chicago fire, on Sunday, October 8, 1871. On that same day, while close to 250 people perished in Chicago, nearly 2,000 perished in the firestorm at the lumber town of Peshtigo and surrounding areas. 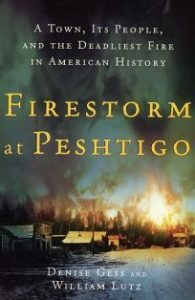 Firestorm at Peshtigo: A Town, Its People, and the Deadliest Fire in American History, an excellent book by Denise Gess and William Lutz, relies on diaries, interviews, and newspaper accounts of the day to detail the people, weather conditions, and politics at the time of the tragedy. The background of the town dominates too many chapters and makes for some tedious reading, at times straying from the book’s focus. 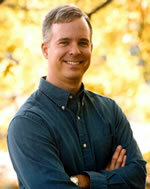 But once the actual firestorm begins, about halfway through, the book picks up steam. Due to destroyed telegraph lines, few initially knew of the magnitude of the destruction and loss of life. So much of the nation’s focus was on the Chicago fire, perhaps since it was a higher-profile city and because news of its disaster was more quickly and widely known. Unlike books about the Titanic and other disasters, few words are spent pointing fingers at negligence or mistakes that could have saved lives. No one could have known what was coming or what the aftermath would be. Describing the tragedy of Peshtigo as a fire is a gross understatement. “Firestorm” is more accurate. What hit this town and nearby regions was nothing less than a fiery tornado spurred on by bizarre weather conditions and fed by a summer drought. Certainly not then or even today can anyone completely explain what took place or why. The aftermath of the firestorm tells a tale, and some accounts are by necessity gruesome and sobering. Many people caught in the tornado spontaneously combusted where they stood and were reduced to only piles of ashes, sometimes with only a few bones left; anything metallic that survived was often used later for identification. In some cases, family members were never found. In one case, “hot sand had been spun into a glass sheet around a tree trunk,” a process requiring amazing heat. Also, in the aftermath, investigators found parts of a train that had been literally swept off its tracks and carried some distance before being destroyed. All that remained were some traces of the metal wheels. Though at times what happened can provide depressing reading, the authors did a good balancing this tendency with stories of heroism and survival. In the end, the fact that Peshtigo is still on the map is a testimony to the resilience of its survivors. I enjoyed this read and look forward to visiting the actual fire museum soon.